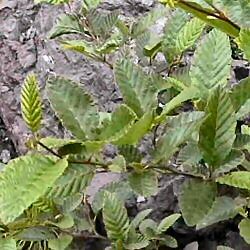 Originating in North America, Red Alder (Alnus rubra) is a particularly attractive tree, fast-growing tree and as with all alders ideal for planting in wet and damp ground. Spring heralds the arrival of very large leaves, which are oval-shaped. Like other alders, slender catkins cloak the branches. Of interest is the inner layers of bark, which when exposed to air change to an elegant orange-red colour, and so hence the name of this tree. Expect a final height of 25m (83ft). Planted along with other alder varieties and Willow (many varieties of willow available) and other varieties of alder, Red Alder forms a worthy addition in the creation of an attractive wetland woodland, ideal for wildlife.